Almost 200,000 rhymes on your phone. 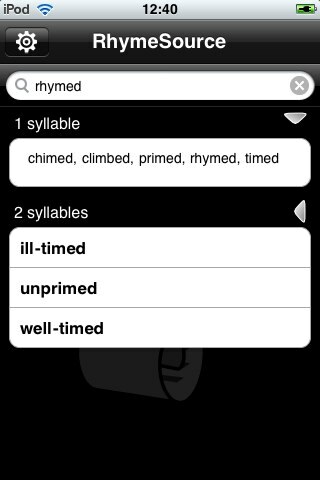 A simple and intuitive interface makes RhymeSource an ideal companion for poets and lyricists. Rhymesource is a combination of two open source phoneme dictionaries to give as many words as possible. The dictionaries have been filtered to reduce the ‘clutter’ words. RhymeSource originated whilst the developer was supposed to be taking a poetry module of a creative writing source and found that all the existing rhyming apps displayed dozens of rhymes that made no sense or were not English.